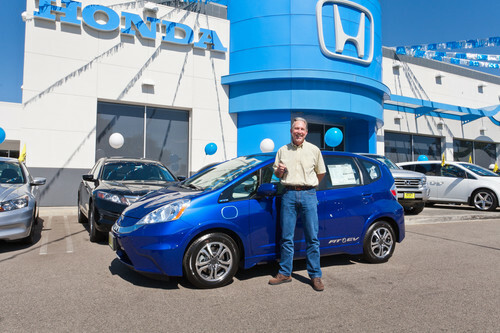 American Honda Motor Co., Inc., delivered the first all-electric 2013 Honda Fit EV to a couple in Southern California, the company announced today. The 2013 Honda Fit EV is the latest in Honda's diverse and expansive portfolio of alternative-fuel vehicles, earning a combined adjusted Environmental Protection Agency (EPA) mile-per-gallon-equivalency rating of 118 MPGe1*, and an unprecedented low consumption rating of just 29 kilowatt hours (kWh) per 100 miles. Ventura County, Calif., residents, Matt and Becky Walton, took delivery of their Honda Fit EV at the Woodland Hills Honda dealership located north of Los Angeles. The couple was the very first registrant to sign up to lease the Fit EV at www.FitEV.Honda.com and plan to use their vehicle as a daily commuter car. Matt and Becky Walton have a long history of owning Honda vehicles, beginning with a Honda N600 sedan and a Honda Z600 coupe in the 1970s and now a Honda Odyssey which will be used as a secondary car. "It's truly an honor to take delivery of the first Honda Fit EV and participate in the advancement of all-electric vehicles in the real world," said Mr. Walton. "The Honda Fit EV is not only a sustainable and energy efficient transportation option with the highest fuel-efficiency rating of any EV, but it has the added bonus of being fun-to-drive and can fully recharge from empty in less than three hours." Addressing a critical step in advancing electric vehicles in the real world, American Honda initially will certify Honda dealers in select California and Oregon markets as Fit EV dealers to provide an excellent customer experience for Fit EV customers' sales and service needs. The Fit EV will be available for lease-only in key markets starting in California and Oregon, after which availability will expand to East Coast markets in early 2013. *132/105/118 city/highway/combined miles per gallon of gasoline-equivalent (MPGe) rating; 82 mile combined (city/highway) driving range rating (adjusted). Ratings determined by U.S. EPA. Your MPGe and range will vary depending on driving conditions, how you drive and maintain your vehicle, battery age/condition, and other factors. For additional information about EPA ratings, visit http://www.fueleconomy.gov/feg/label/learn-more-electric-label.shtml.